Warm welcome visit our shoes display rack, this is Lisa from Shenzhen Unique furniture ltd, we are a direct factory mainly do customized for mall kiosk , we have more than 10 years experience , we have done lots of mall kiosk before, all of them are customized according to our client’s requirement . Color : white, red . Design : 3d drawing . 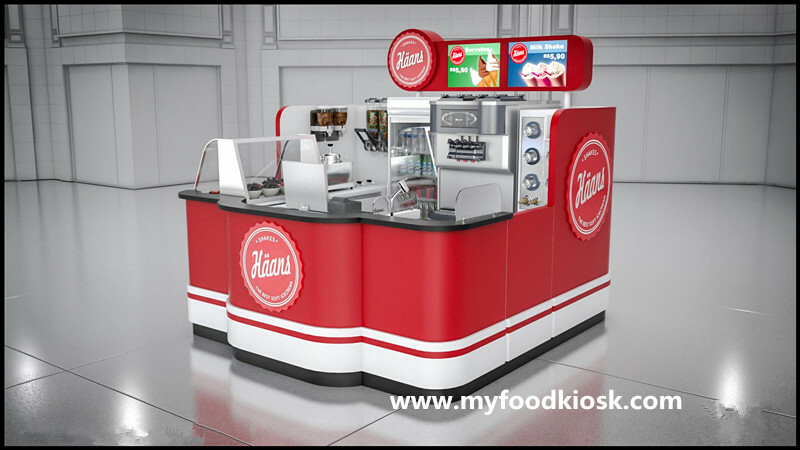 As you see this ice cream kiosk, size about is 3000*3000mm, 2200mm height , base material is MDF, surface is red and white glossy baking painting finished , wooden cabinet, white corian work table, stainless steel skirting, if you have any ideas about this kiosk build pls let me know freely. 1. 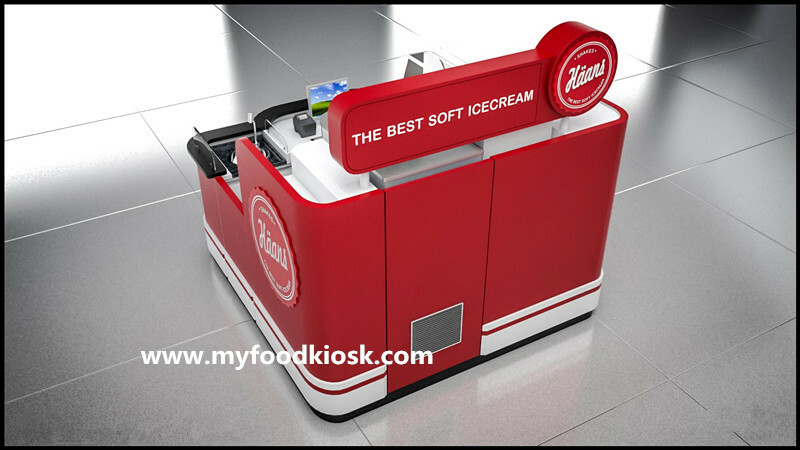 Eco-friendly, healthy, non-toxic materials of ice cream kiosk . 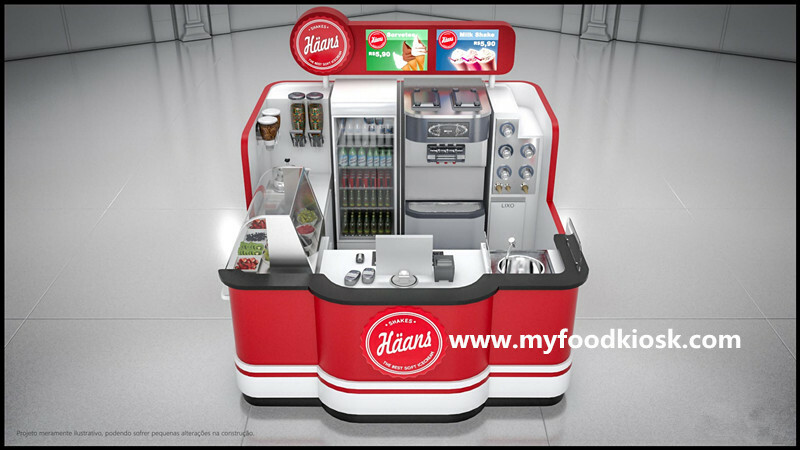 1.12 top professional designers to guarantee perfect and creative ice cream kiosk . 1. 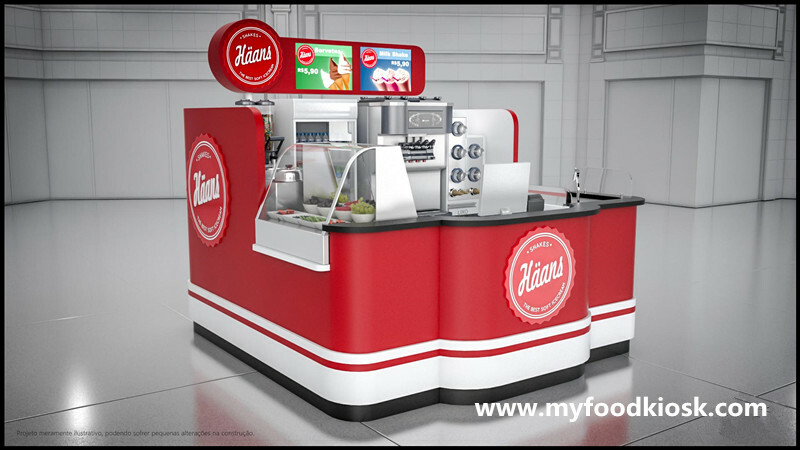 More than 10 year-experience on commercial display furniture manufacturer especially in ice cream kiosk . 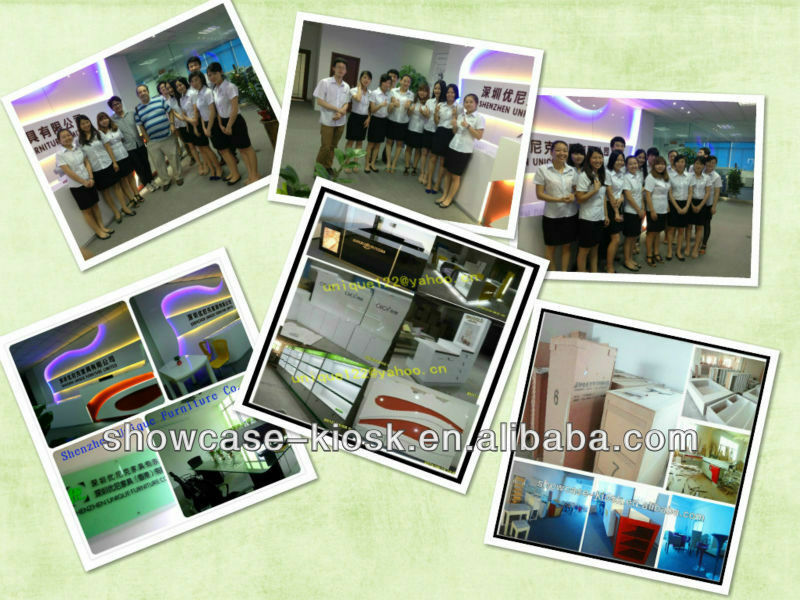 Shenzhen Unique furniture limited company, honored as China’s leading shopping malls and stores furnituresuppliers, has more than ten year experience in creating professional showcase, cabinet, kiosks. 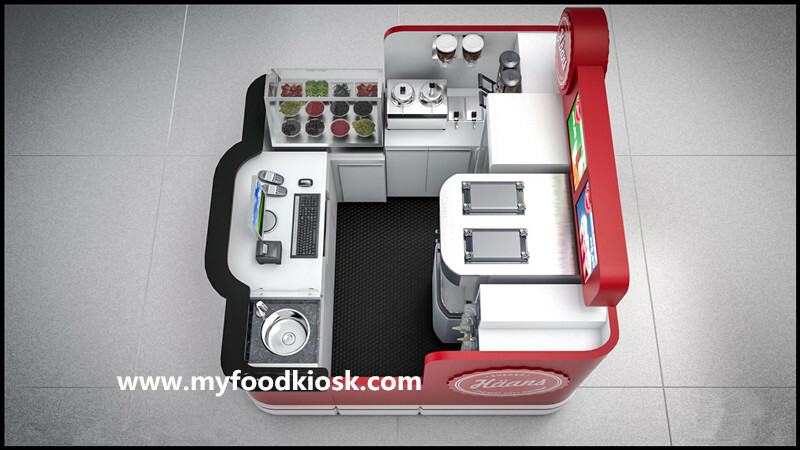 We design different kinds of shopping malls kiosk, counters, cabinet ,carts, food kiosk ,coffee kiosk , tea kiosk ,hair dressing kiosk and showcase , some as cashier, jewelry , jewelry store design decoration, cosmetics showcase, showcase mobile phone, clothingshoes showcase, crafts gift showcase, supermarket stores overall matching furniture various special-shaped showcase. 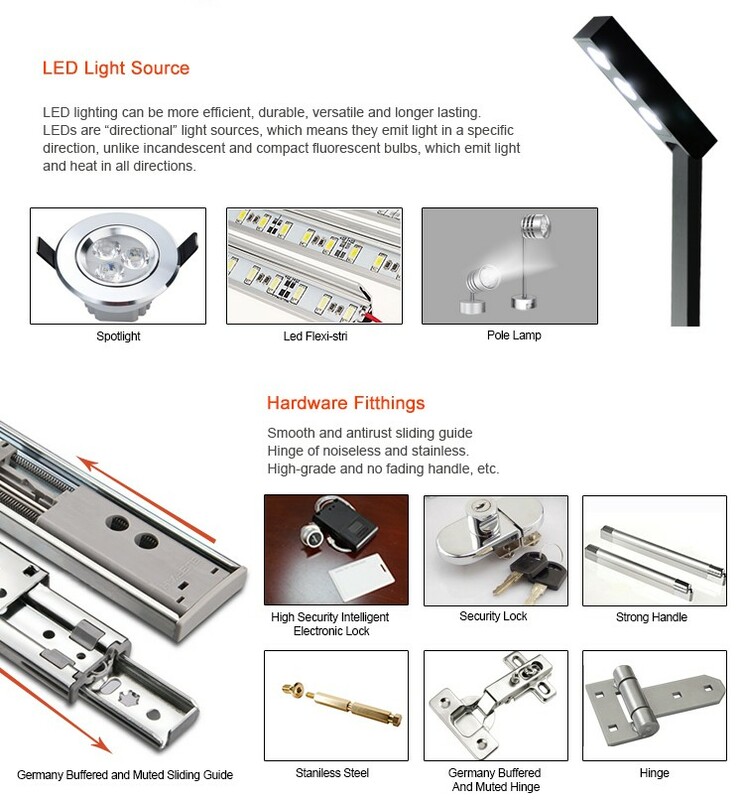 Our work Process covers the carpentry, paint, hardware, stainless steel, iron, acrylic, we can make it in fashion and unique style, we have personalized management, standardized production process,advanced process equipment. We can design large shopping center and complete the construction of large area, restaurants, coffee shops, clothing stores decoration design quantity format. Make your brand in the market to win more benefits. In 2005 we were honored as evaluated for the local characteristics of Shenzhen Enterprises.In 2009 we got the name Shenzhen Business Excellence Award Professional showcase industry. Step1. Tell me your details. 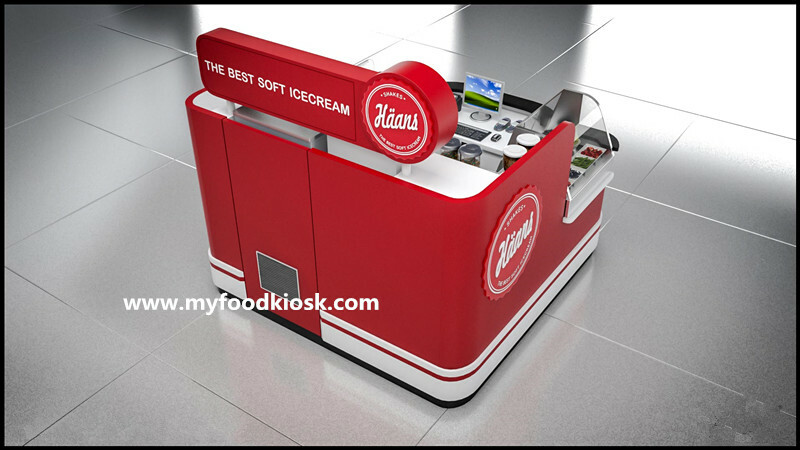 I need know your style of ice cream kiosk , your size of ice cream kiosk /mall, Color of design, and so on. Step2. 3D design. After knowing all your details, we could design it for you. Now , we will draw the 3D design for you (it will not exceed 3 times) Also, none of our customer has over 3 times to design it ,because we have professional design teams. Step3. Deposit. Before sending you the design, you need pay the design fee. The fee depend on your shoes kiosk size and style. Step4. Production. All things approved, we will produce it . But, before this, you need pay 50% deposit. You know, it needs understand each other. We have risk production it, including cost. Step5. Final Picture for you. Before delivery, we will show you the final design picture for you. You will know how does it look like. Step6. Delivery. Now , it is time to delivery. We need know your port and ship to you. But, you need pay the rest of money for it. Step7. After-sales service . We will follow the delivery and confirm it could arrive you safely and on time.